Port: Set the name of the RS 232 port. The speed is fixed to 9600 baud. Position: shows the actual position. Speed, Timer: As described above. Absolute goto: the focuser moves to the absolute position. Relative goto: the focuser moves the defined ticks (negative or positive). Options: the settings step delay and motor steps per tick determine how fast the stepper motor turns. The duty cycle is can be set to zero for a main mirror focuser setup and to a decent value for a rack and pinion focuser. Read the RoboFocus manual. Extrema: the movement of the focuser and the position setting can be limited. Set register Position: set the counter to the value given in the input field. Set register Backlash: define the amount of ticks. If the back lash correction and the absolute or relative movement have opposite signs RoboFocus will move into the negative direction of the main movement at the end. Focus Direction: in or out with respect to the primary objective. 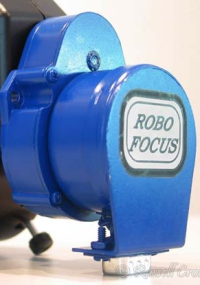 Focus Speed: Since RoboFocus is based on a stepper motor, speed is constant. Focus Time: The duration of the focus motion in milliseconds before halt. Robofocus driver provides the following features: absolute and relative movement, resetting the counter to a given position, maximum and minimum travel, backlash compensation, duty cycle, step delay, number of motor steps per counter increment (tick), the read out of the built in temperature sensor and the four output lines used to control the remote power modules (optional accessories).